IBM® Program Work Center™ has all the tools you need to manage projects, programs and transformations globally. Scale from smaller projects to thousands of users with hundreds of programs. Templates capture best practices for repeatable results – promoting consistency in execution and improvement by factoring learning into your process. Duration-based and effort-based planning disciplines are available and all project data is available for reporting via dashboards and reports. Your executive stakeholders, team members and project managers leverage the same project information in real time. A flexible and secure permissions capability presents users the information they need – when they need it. Team members can enter progress against their tasks, and collaborate with email notifications. Use Program Work Center's modules to manage Issues and Risks to track key information that impacts your project's health. Like the web, all the information in Program Work Center can be linked so risks that might impact delivery dates are visible from our task view and Gannt charts. Custom fields are available so that information specific to your organization can be tracked and reported on for issues, risks, tasks – and more. Program Work Center's Change Control module provides project managers with the tools needed to track changes, estimate the impact on cost and schedule and support a disciplined model – to review and accept changes to project plans. Project changes can have custom fields for capturing information unique to your organization, and change can be included in reports for your change review board. Reports can be generated by our report builder, or the power of our report engine is available through custom reports that provide information for your decision makers and project managers. 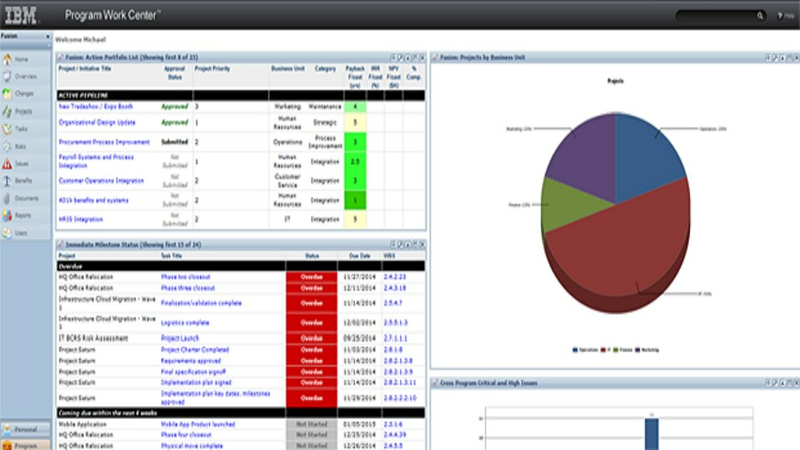 Dashboards can easily be configured for different roles to eliminate the need for lengthy status meetings. Our writeable reports capability turns any report into an editable spreadsheet so that updates to key information in a report are saved in the database and available to all users at the same time. Program Work Center provides a familiar tree structure/folder interface for managing documents. Our robust permissions apply to documents and folders, allowing your team members to see only the information they need to get the job done. Version control allows granular tracking of modifications. Documents can be linked to tasks, issues and business benefits to turn them into an integral part of managing your project. Are your users more comfortable working with Microsoft® Excel or Microsoft® Project? Program Work Center provides import and export of MS Project and Excel files. Optional task locking ensures that users working offline can control edits and changes. All reports in the system are exportable to Excel or PDF. Our integration with IBM® Rational Team Concert™ will link your development team’s efforts to your projects without the need for your developers to login to a project management tool. How do you easily manage project details, make assignments and review reports? 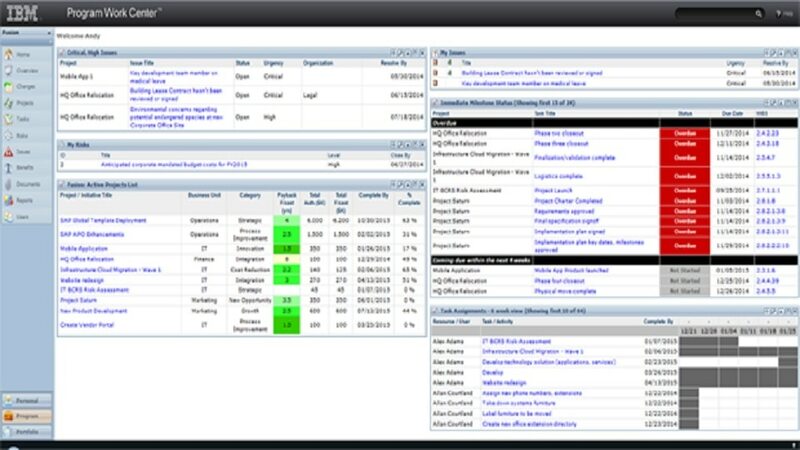 IBM® Program Work Center™ can manage tasks, dependencies, milestones, risk, issues and critical path. It allows you to review reports of overdue tasks and key milestones – or visualize project status with the task or Gannt chart views. How can you stay on top of projects and understand potential risks? 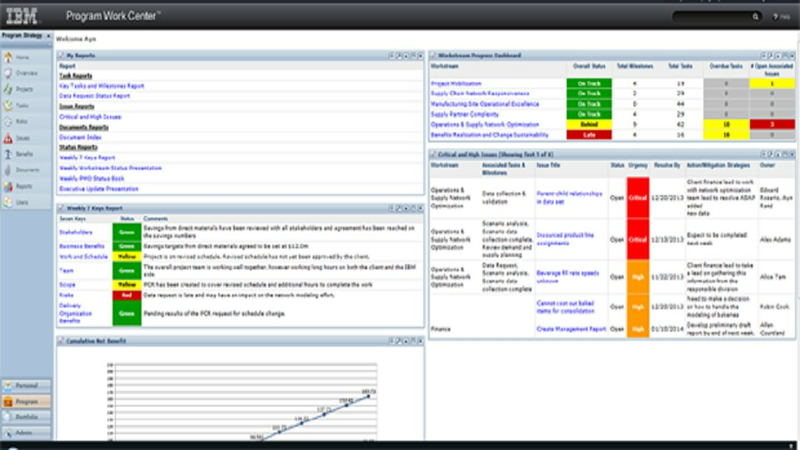 Program Work Center keeps you updated on assigned tasks, issues and risks. It allows you to quickly review project status and receive notifications of task, risks and issue assignments. How can you simplify project management and keep everyone current? Keep team members updated with assigned tasks, issues and risks with Program Work Center. Use it to review project status and receive notifications of task, risks issue assignments.